Rosacea is a condition that causes small, red, pus-filled bumps on the face. This condition affects more than three million people per year, with fair skin, middle aged women being the most common. Rosacea can be mistaken for acne and other skin conditions. Although rosacea can not be cured, vascular laser treatment can help. At the Dermatology Center for Skin Health, we use the VBeam Perfecta®, the gold standard and the world’s best pulsed dye laser. This system is a safe way to treat vascular, pigmented and certain non-pigmented lesions. The VBeam delivers laser energy in pulses. The dye generates laser beams of different colors. Specific blood vessels, or melanin-pigmented areas, in the skin absorb the light. Wrinkles are a part of the aging process that we all experience; however, it doesn’t mean we have to accept their appearance. Treatment for wrinkles can range from topical creams to cosmetic procedures including Botox®, dermal fillers and chemical peels. Botox® injections use botulinum toxin to temporarily paralyze muscle activity in the treated area. In order for muscles to contract, nerves release a chemical messenger at the junction where the nerve endings meet muscle cells. The messenger attaches to receptors on the muscle cells and causes the muscle cells to contract or shorten. Injected Botox® prevents the release of the messenger, preventing contraction of the muscle cells. This stops wrinkles that would have formed as a result of repetitive muscle contraction. Topical products that can treat/prevent wrinkles include the Dermatology Center’s Retinol Smoothing Serum, Glycolix Elite Facial Cream, Antioxidant Sunscreen SPF 50+ and many more. The Retinol Smoothing Serum increases firmness and elasticity, reduces the appearance of wrinkles, fine lines, redness and pore size. It helps to achieve more radiant looking skin, while delivering the skin enhancing benefits of Green Tea Polyphenols and Caffiene USP in a moisturizing base. Psoriasis is a skin condition where skin cells build up and form scales. This condition produces dry, itchy patches in the affected area. Psoriasis affects more than three million people per year, with the largest patient demographic being 19 years of age, or older. While this condition can not be cured, it can be treated with topical products. The goal is to remove the scales and decrease the rapid growth of skin cells. There are multiple prescription medications and therapies for Psoriasis. Consult with your dermatologists to determine which treatment method would be best for you. Acne is the most common skin condition we treat at our office. Acne affects up to 85% of teens (mostly males) and young adults (mostly females). At the Dermatology Center, we see many patients who have tried multiple over-the-counter products with no improvement. Acne CAN be cured, and we want to help. 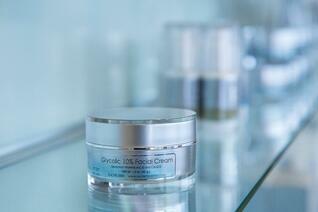 We offer several different products and services proven to be effective in acne treatment. Common acne medications include salicylic acid, benzoyl peroxide, alpha hydroxy acids, topical retinoids, oral antibiotics and isotretinoin. Good skin care habits can go a long way in preventing future skin problems. We can help you establish a healthy skin care routine. Common skin care issues include cold sores, hives, warts, blisters and calluses. Warts are most common on the hands and feet. They can range in size. Warts usually go away on their own; however, it they do not, you can make an appointment with your dermatologist to remove them. Treatment could include freezing, prescribing an at-home treatment or both. Dry skin can happen for a range of reasons including dehydration or using products that are drying. When buying skin care products, read the ingredients. Limit the use of products with alcohol, mineral oil, and fragranced skin products, as these ingredients can cause irritation and clogged pores. Take the guesswork out of what products you should be using and make an appointment with your dermatologist. Did you know the rate of skin cancer in West Virginia is actually higher than southern states like New Mexico, Texas and Louisiana? This is because many people fail to use sunscreen or sunblock through the winter months. Read our blog about the difference between sunscreen and sunblock. Wearing sunblock or sunscreen is just one way to prevent skin cancer. Other means of prevention include wearing protective clothing, getting routine skin exams and avoiding tanning beds. You can use the ABCDE method to monitor the changes in your moles. If you suspect that you have skin cancer, it is important that you make an appointment with your dermatologist. Read our in-depth blog on these tips! At the Dermatology Center for Skin Health, we are committed to helping you lead a life that promotes healthy skin. If you have a skin condition, and aren’t sure what your options are, give us a call.